Jinxy Knows Best: Aloha Friday! 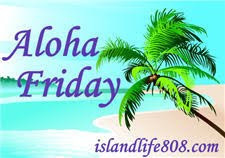 It's time for Aloha Friday where I ask you a simple question, give you my answer and then see what YOU have to say! My answer: Bread! I love bread of all types! Your turn: Leave a comment letting me know YOUR answer! Thanks to Kailani at An Island Life for the fun tradition of Aloha Friday. Head over to her blog and sign the MckLinky to participate. Potatoes I could eat potatoes forever! The answer of course is pizza... or any form of cheese plus sauce plus bread....that is my pick. In fact there was a period of time living in NYC where I did eat pizza for 8 days straight.. I felt very bad about it,,, after but during it was DELICIOUS!! Pasta...in any form with any sauce...yummy!